I received a lot of requests for copies of a document I published a year ago, Troubleshooting Common Computer Problems. At the suggestion of Edtech Sandy (aka Sandy Kendell), I tried to upload it through Google Docs to no avail (though it kind of worked in my WordPress.org site) so I’m guessing WordPress.com doesn’t allow Google Docs. Please feel free to disabuse me of that conclusion. Tags: computer problems, problem solving, Tech Tips, third grade. Bookmark the permalink. Previous post ← Weekend Websites–Where’d My Newsletter Go! Gee thanks for this wonderful post! You always give us great information. I personally find this interesting and really clears me off from my questions. I’m, beginning to know that I really learn lesser than I knew..
I’m always surprised how many parents of my students don’t know these simple solutions. They think I’m brilliant when their children come home with these fixes. Hehe. Hi, I’m Nicolene Esperanza Menezes and I am from Cape Town, South Africa. I have a problem; When i turn my p.c on It powers up and makes one beep which is good but my monitor doesn’t go on even though my monitor goes on when any other p.c is connected to it. What is the problem and how do i solve it. Thank you. Hi Nicole, I’m sure you wiggled the plugs–that’s always a good starting point. Then unplug, count to ten and replug. Sometimes (more times than you’d believe) that fixes it. If there’s no joy, it sounds like either the software for the video card in the computer box–the CPU–or the hardware itself. Is it still under warranty? Or, can you have someone check that? Good luck! This is definitely a problem a third grader can’t solve! What app are you trying to use? pls I need a solution to my problem. My del laptop can not detect any external accessories or peripheral if I insert in my laptop port hub. Check your drivers for the port. They may need an update. I have a similar problem right now with my HDMI port. there is two possible solution for this kind of problem. 2. your usb port may be disabled in the computer. Solve: right click on My computer->Manage->Device manager->now if your external accessories are for USB port the right click on the Universal Serial Bus and click on the update driver. You can also check your local group policy editor..
why cpu makes a beep sound. Many beep sounds are standard. Is it giving you a problem? i see a green line left side of my screen. it is present even in the time of booting. will you tell me a solution ? pls……. It sounds like a hardware issue. How old is the monitor? That’s not very old. Monitors should last 5+ years. It could be a driver issue, but those are hard to diagnose via internet. Are your video drivers up to date? Good you don’t have a virus. There are a lot of reasons why it could run slowly. Try Adaware and Spybot. They’ll help clean things out also. Also, run a defrag. Alternatively you may remove programs that you rarely use and clear temp folder. do this by running a reg. editor. good luck. Why is my computer not being able to download resumes and won’t open them to see them? Can you give me more detail? What’s the error message? You could have malware, or a virus that is causing your fan to run hard. Your processor could also be over loaded with too many programs running at the same time. Try to find out how old is your computer. You may need to have either the CPU upgraded, or you can have a more robust cooling fan installed in your Hard drive. I always start with the basics–is the monitor plugged in, turned on? If you attach a different monitor to your CPU, does it work? Pleace am junioer computer maintainance. Pleace can u send me document by my address computer problem & solution. Pleace & 10q! hi my problem is about desktop icons many times it changes different many files shape and not open y? Cn you give me a few more details? I’ll see if I can help. What are the common problems that the students encounter in the computer? I’ve added the pdf and an image of 25 common problems. For some reason the Scribd doc isn’t showing up today. The file(s) that the icon(s) are for, may have been deleted, and are no longer on your computer. Scan your computer for viruses, then reboot your system. when i turn on my computer power supply(socket) the cpu turns itself on and the monitor displays a yellow light instead of a blue light on the power button.Neither does the mouse nor the keyboard turn on.its a dell vostro. Yellow is stand-by. The monitor is getting power, but not connected to the CPU. Start by checking the connections. I do get questions about hardware which I can’t answer. I’m more of a software/widget gal. BTW, the link doesn’t work. Can you update? Always start with a virus check and a defrag. enter BIOS setup and access ‘power on self test’, ‘start up diagnostics’ ( disable this) . select/ look for an option called fast boot or quick boot and enable this. you can also change the boot priority by selecting the hard drive as the first boot option. save changes and reboot. Alternatively, if your PC is more than one year old call an expert to flash/ update your BIOS to a later version. your PC should be able to boot faster now. Good luck. My first solution when browsers act up is to change browsers. There are so many add-ons and widgets, I don’t think any one browser can keep up. I keep FireFox, Chrome and IE open at all times so I can copy-paste an address from one to the other to get it to work correctly. I teach my students to do that, also. Windows. I need to do a problem-solving for Macs! That’s happening to several of my lab computers. I’ll let you know if my IT guys come up with a solution. 1.Restart F8 – then choose last known good confguration. does it work? 2. you can restore your system from last configuration of your windows. you can type system into search bar then it automatically showing up..then choose latest updates then click restore. does it work? 3. try to remove all your memory, clean it and then replaced both memory in your slots. does it work? Thanks, Sniper. I’m going to try that. I will have to leave this for readers. I’m not too savvy about hardware. why cpu’s green globs continuously and seems not display on monitor? I don’t understand, Oscar. Can you clarify? blue sound bar pops up on my screen at various times freezing my keyboard. I replaced keyboard but problem still exists. Can you help ? I’m not sure what a ‘blue sound bar’ is. Can you send a screen shot to askatechteacher at gmail dot com? I’m afraid I’m useless on this. When I depress those keys, they accomplish their purpose without bringing up a blue bar. Twere me (in your shoes), if it happens every time, I’d unprogram those buttons and use the volume control in the systray until I figured out the answer. I suspect you tried reboot already? I have a Asus DVD weiter. It’s not ejecting. I had this problem before. But now it’s not ejecting for about a month. Plz, give me solution……..
There’s a small hole under most DVD drives that allows for emergency eject. Slip a straightened paper clip into that hole, wiggle around until you feel it catch on something and then slowly remove. It should pop the drive out. I’m sorry I don’t think I understand your question? Will the laptop not allow mouse clicks or finger clicks? in mouse no problem.. only in touch laptop touch this problem.. It could be a driver issue. Go to the Acer website. Search your laptop and see if there are fixes they offer. If it’s still under warranty, have the seller swap it for you. I’ve heard of others with this problem. It’s not as unusual as you’d hope with laptops. Now you’re outside my expertise. When I get stuck on a problem, I google it and YouTube it. Often, you’ll find help. Good luck! Tech surely stretches the brain, doesn’t it? Well, these 20 require only brainpower. Others–like crashed hard drive–not so much. It sounds like a monitor problem. Can you give me more details? My PC sound system did not work well..
so, what i do now..
My laptop does not shutdown. When you click shutdown, it rather restarts unless I use the power button to shut it. What is the problem and how can I resolve it? Something in the shutdown routine is hanging it up. Ctrl+Alt+Del and see if you can identify it. Your advice has not offered real solution to my problem. Are there other steps that I can take? Twere me, I’d probably do a reformat (after running virus/malware checks, defragging, and cleaning out the computer of old files. If you download a lot (don’t know if you do), expect to reformat every 6-12 months. It’s a pain. I was charging my laptop when l noticed the laptop and the battery were extremely hot.now it won’t come on what do? Oh boy. Let it cool and try again. Doesn’t sound good. I was using my computer and it shut suddenly. A very interesting blog you have got here, I personally am very comfortable with computers but its good to know that people actually respond and look over the web for such info. Highly appreciated. As a matter of fact, I also run my blog, http://www.technosomes.com | A Technology Blog.. I wish you can take a look and maybe we can share some ideas on how to take it forward. Though the outlook is not entirely different.You being a veteran, it would be easy for you to assess my blog, and my writing style, provide some valuable feedback. Please write back to me..Appreciate your work here. Looks nice, Shantanu. Lots of techie news. hii mam, my computer back button is not working. So i am closing every application which is opened, What is the solution to make it work? I’d reboot. If you don’t want to close everything down, do a right-click on the internet page. The drop down list provides the ‘back’ option. I want you to please help to list 20 problems of computers and solutions to them. Hi Alhaji–it’s downloadable from that Scribd link. Enjoy! The solutions provided above are very helpful. But for some computer problem such as BSOD’s, slow PC etc., one has to contact the expert to resolve the issue. I always prefer to call on the toll-free number of AskPCTechies to resolve the issue completely. Absolutely. These are only the ones K-5 students can easily solve. Thanks for the link, James. wheathr s it activated or not? please give us the main error occur. are you trying to access the network through LAN? sir, i have connected my pc to an android tab via a data cable. But after that my pc’s display changed, became greyish. tell me the solution of the problem. 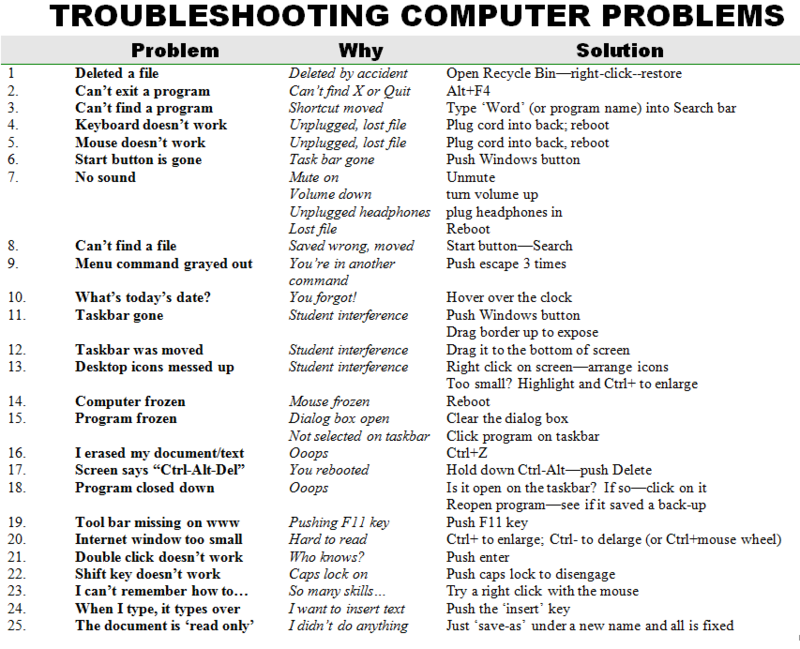 help me..i need it as soon as possible.what are the types of online computer problem and trousblehoot?? give me an example o..i dont understand much..i’m doing my assignment. i started my computer after nearly 2 months and as soon as i started my pc a black screen appeared and it said error…disk failure or system not booted…..it also said media test failure and check ur cable…..pls help me.. When I switch on the computer and turn on the cup the moniter doeanot turns on on the moniter it is written that “in power safe mode move your mouse or press any key of the keyboard and when I move the mouse nothing happens and my keyboard is new bit still there is no light flowing on it. Please help me. hi my hp loptop is not working properly when i open firefox it takes time too and sometime i get a message from my antivirus tat your computer might be at risk what to do? If you have Windows, their built-in anti-virus is great. That’ll take care of problems. thank u very much u’ve just made my work easy.